Our 90 degree Flue bend stove pipe is constructed with the highest quality heavy gauge steel and has a durable black enamel coating. This single-wall 150mm (6") flue pipe is designed for internal use only and will suit both gas or solid fuel stoves. The exposed stove pipe will look stunning no matter what style of decor you have in your home. The black enamel finish creates a soft and modern feel. The coating is made to match the traditional finish found on wood burning or multi-fuel stoves. 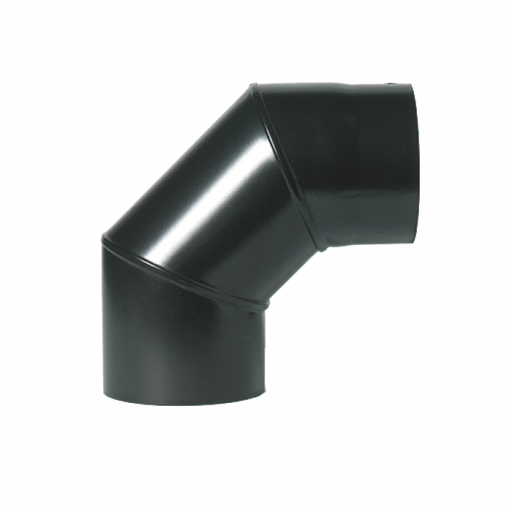 This high-temperature stove pipe is indicated for use only when connecting a stove into a proper flue system or an existing chimney. Use this 90 degree bend stove pipe to connect to the rear exit of the stove which will create a vertical direction for flue ventilation. This item should not be used to create an offset in your flue line. It is advised to seal all single-wall pipe joints with an approved high-temperature sealant. It is also advised to not cut this flue pipe down to size. Due to heat transfer, it is against regulation to pass a single-wall pipe through any material and to limit runs to 2000mm. This will prevent heat loss in the pipe, which can allow flue gasses to drop.